My hubby brought home his catch of 4 crabs today. As I have a recipe for steamed crabs in my 'to try' list of recipes, I just follow it. 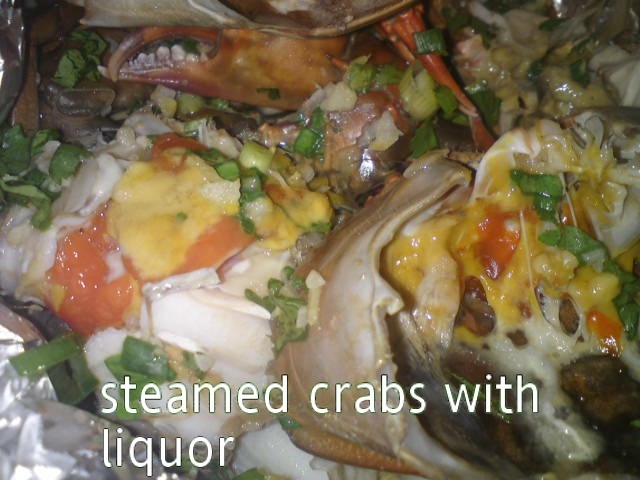 The steamed crabs have a strong flavour of brandy and ginger garlic aroma. 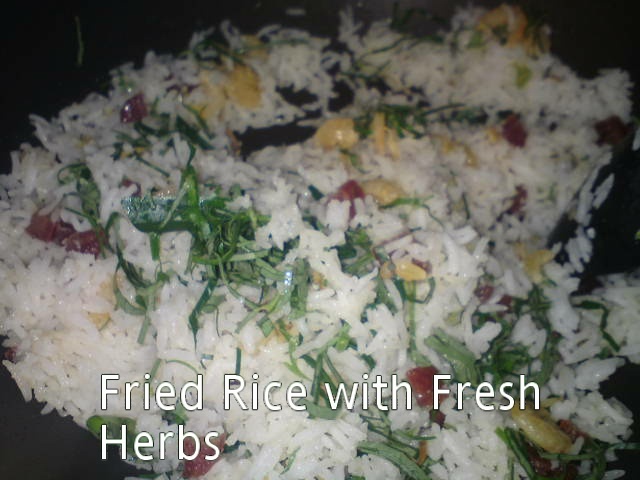 Simple dish that goes well with steamed flavoured rice. Heat wok with sesame oil to saute ginger and garlic. Dish out into a bowl to cool a little. Add in egg, brandy and salt. Mix well and add in the chopped coriander and spring onion [keep some for garnishing]. 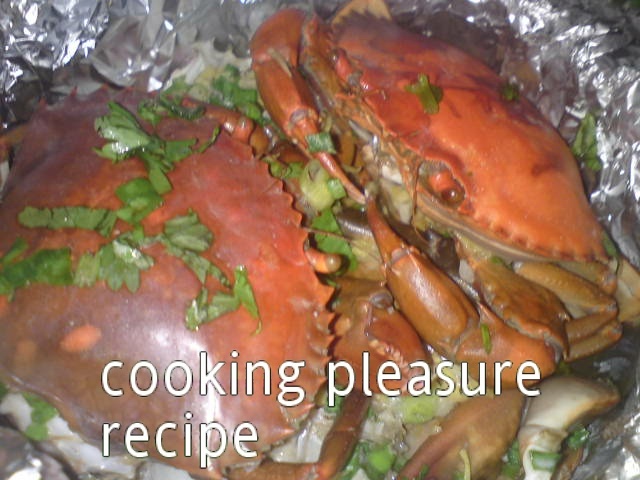 Place crabs in a casserole dish [I used a bamboo steamer and lined it with foil]. Pour mixture over crabs. Cover the crabs and steam over boiling water for 30 minutes or until crabs are cooked or changed colour. 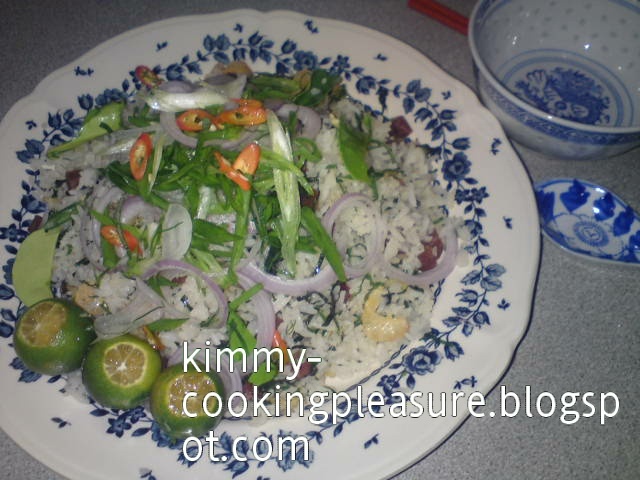 Serve with plain rice [I served the crabs with a steamed flavoured rice and zuchini relish]. Saute garlic and ginger in sesame oil until fragrant. Add in the rice and all the seasoning. Stir fry to mix well and dish out into a steaming tray. Pour in enough water to cook rice. 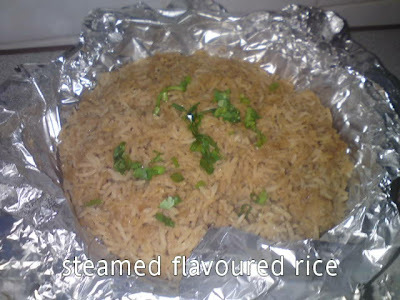 Steam rice over boiling water for 25 minutes or until rice is cooked. Off fire. I fluffed up the rice, transfer to a casserole dish lined with foil. Fold up the foil and set aside for reheating when I steam the crabs [all can be prepared ahead of meal time - less preparation and cleaning]. Before serving, I steamed both the crabs and rice together. Put sliced zuchini in icy cold water for 5 minutes. Drain off water in a colander. Transfer to a bowl. Mix sugar and salt with lime juice, then pour over zuchini. Mix well and cover. 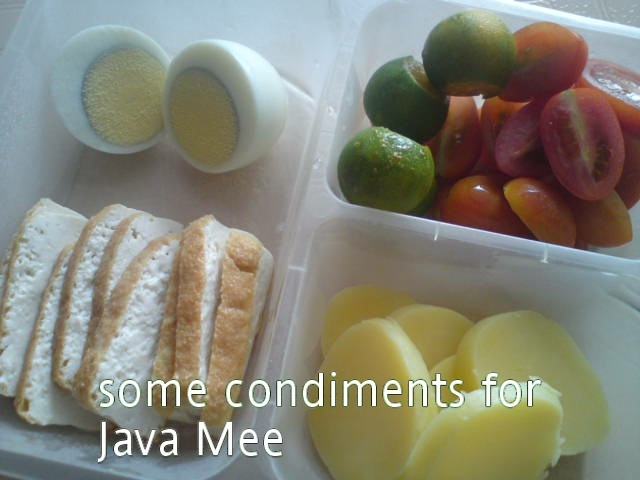 Keep in fridge until serving time. When cooking for dinner, I sometimes prefer not to fry vegetables but instead will prepare a salad or salsa. 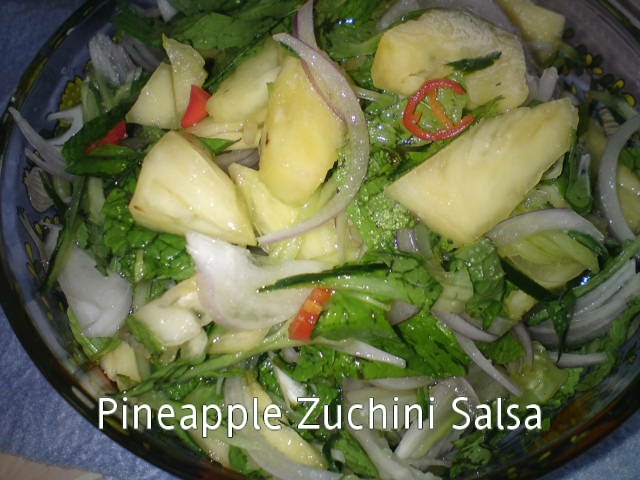 With salsa, I can use a variety of vegetables and even fruits in it. Here is a simple Salsa recipe which I came across in some food blogs sometime ago. Appetising, refreshing and light. Prepare vegetables and fruits as above. Mix all in a big bowl. Pour in combined seasoning ingredients. Toss well and transfer to a serving dish. Cover with cling wrap and refrigerate until serving time. This is actually a Nastar bun recipe with cheddar cheese filling but I used it to bake the braided loaf as I was short of time. It turns out well, the texture is soft and moist. You can make 10 Nastar buns from this quantity. Just divide dough into 10 portions. Roll each portion into a rectangle, fill with a piece of cheddar cheese. Then roll up into a swiss roll, seal the edges, cut across the buns. Place bun in a paper cup to proof until double in size. Before baking, brush with egg glaze and top up with small bits of cheese. Baked at 180 degrees C for 20 minutes. I will try to bake these buns when I have enough time to spare. The quantity in bracket [in red ink] is for 1 loaf of bread. Mix all ingredients into a soft rough dough. Cover and leave to proof for at least 1-2 hours or keep in airtight container and refrigerate for at least 4 hours. Thaw for 10-15 minutes before use. Add all the ingredients [except water and butter] to the sponge dough. Knead until well combined, then gradually add in water while kneading until a soft dough is formed [you may not need all the water]. Knead for about 10 minutes then add in butter. Continue kneading until soft, smooth and dough is not sticky [about 10 minutes on high speed]. Divide dough into 2 equal portions. Roll and fold each portion into thirds, then roll into a log. Flatten and cut into 3 strips and braid. Place in baking tin [Pullman's tin] and leave to proof in oven for more than an hour or until double in size. [Best to proof for 1-2 hours]. Remove from oven when you preheat the oven. This is a family style/way of cooking a variety of noodles [beehoon, instant noodles, soybean noodles and fat rice vermicelli]. Most times, yam or pumpkin are used to cook the noodle soup but you can omit these if cooking for 1 or 2 people. Of course, if yam is added the soup will be thicker when it turns soft and more aromatic because of the yam. Here I am not adding yam because I am cooking it for a light lunch. Blanched noodles in boiling water to cook and drain [cook noodles as per instructions - depending on what noodles used]. Set aside. Heat oil in a saucepan, saute shallots and garlic until aromatic and golden. 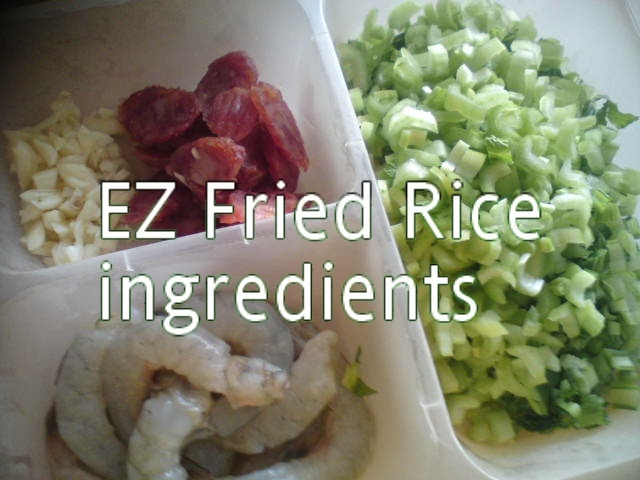 Add in mushrooms and dried prawns, fry for a second. Then add in the meat slices. Fry until aromatic, add in water and seasoning. Let it boil for 5-10 minutes. Taste to adjust seasoning. Off fire. Can prepare until this stage and keep aside until meal time. 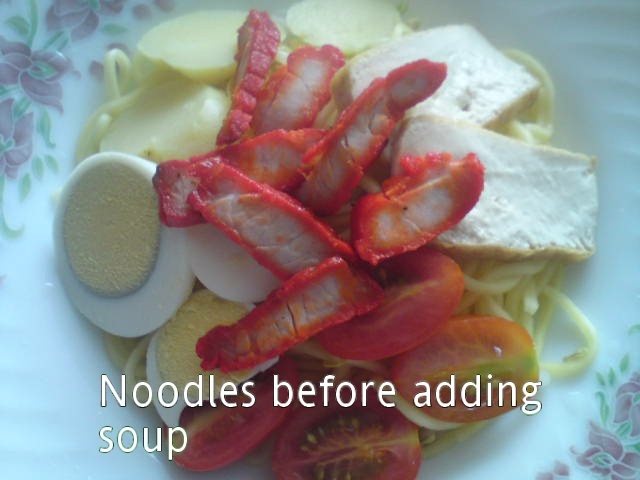 When serving noodles, bring soup to boil again, add in noodles and vegetables. When vegetables are cooked, dish out into a bowl to serve. Add pepper and red chilli. [When cooking for 1, I used a claypot to cook the soup and serve noodles in claypot - less cleaning up to do]. You can use any type of leafy vegetables you prefer. I usually add more vegetables and try to cut down on meat. A simple and healthy dish that you can prepare in any quantity. Seen this recipe on one of the TV cook shows. The mushrooms are very fragrant and sweet. Assorted fresh mushrooms [abalone, shimeji or king etc] available - remove root portions, wash and drain. Heat wok with oil until hot add salt, then the vegetables. Stir fry on high heat until cooked. Dish out on serving plate. 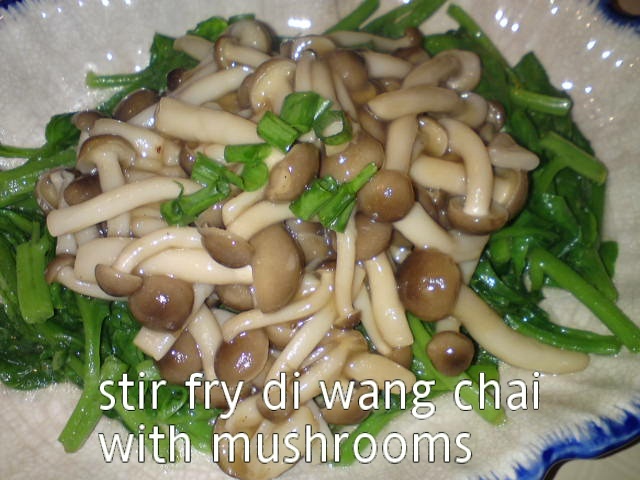 Using the same wok, add in fresh mushrooms. Stir fry for 2-3 seconds, then add in wine, oyster sauce, light soy sauce, salt and sugar to taste. Braise mushrooms for a few seconds then thicken lightly with cornflour mix. Dish out on top of fried emperor vegetable [aka hong thay chye]. 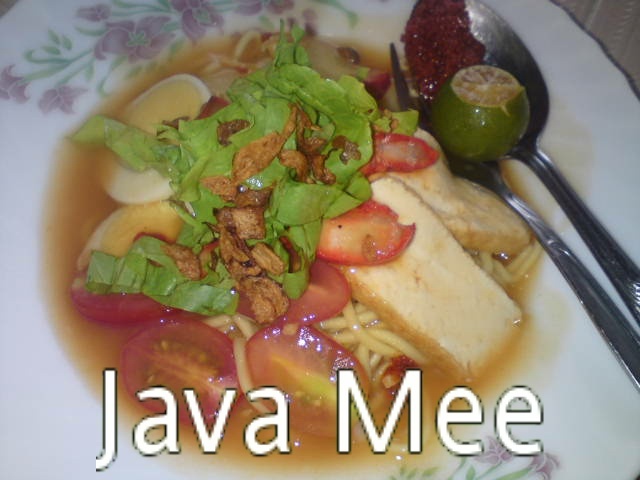 This is a smaller quantity of home-cooked version of Java Mee which I prepared over the weekend enough for 3 - 4 people [depending on whether they are great eaters]. 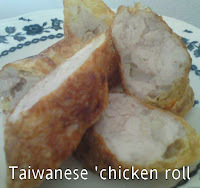 The first posting on May 30, 2011 was prepared by my sister in-law [following my Ma's recipe] which was good. This is my own version which my hubby likes and enjoyed very much. 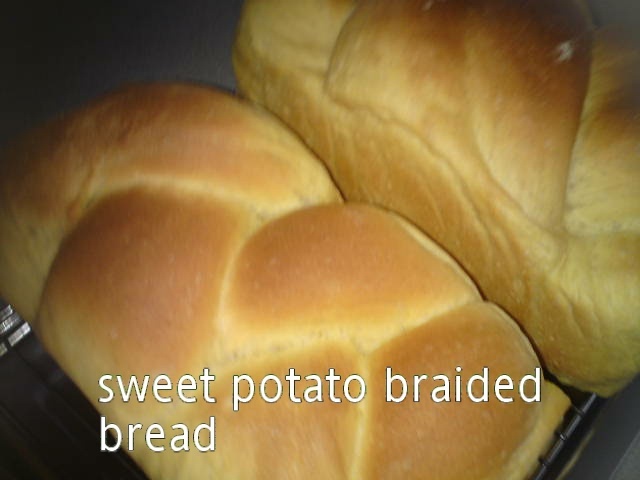 Remove skin of sweet potatoes. Wash and cut into big chunks and steam for about 25 minutes till soft [I usually will prepare more and use it to bake bread or steamed buns]. While hot, mash sweet potatoes quickly into a fine paste. Mix paste with about 1/2 the water and strain stock into a boiling pot. Discard the rough and fibrous part of sweet potato which is left on the sieve. This step is necessary to get a smooth thick stock for the soup. You will notice the different stock texture here and in the earlier posting. Add remaining water to stock. Bring the stock to boil then add in salt, sugar, msg and tomato sauce. 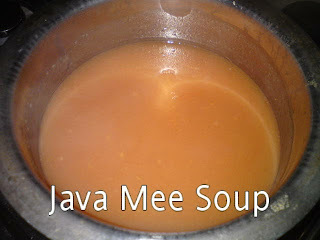 Boil stock for 10 minutes and taste soup to adjusting seasoning [the soup should taste sweet and slightly sourish] . Then thicken with cornstarch mix. Bring to a boil and off fire. Double boil soup to keep the soup hot and prevent the bottom of the soup from being burnt because it is thick. Or just reheat soup after preparing the noodles for serving. To serve noodles, prepare a pot of boiling water, cook noodles and beansprouts together [quantity depends on own appetite]. Drip dry the noodles after boiling and place on serving plate. Top up with all the condiements [sliced potato, beancurd, tomato, eggs and char siew]. Put 2-3 scoops of hot soup [quantity enough to cover noodles] over noodles, top with lettuce, fried shallots and lime wedges. 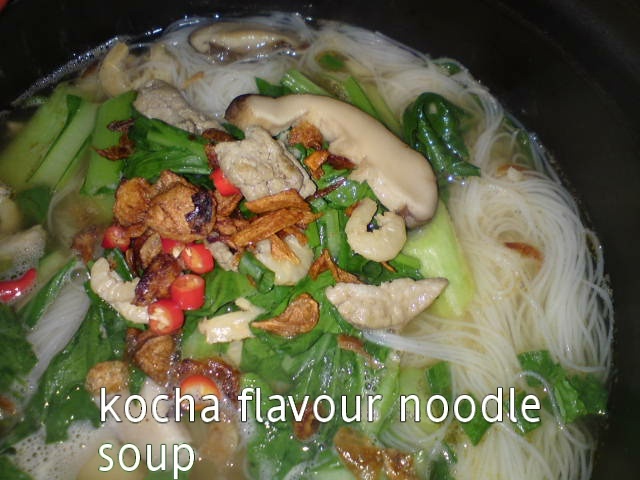 Add in fried chilli paste to serve [if you want spicy noodles]. Note: Can add more tomato sauce or any of the above ingredients according to own preference. Some people prefer to mix yellow noodles and rice vermicelli. All depends on own preference. During our younger days, my Ma used to cook this dish for the family. 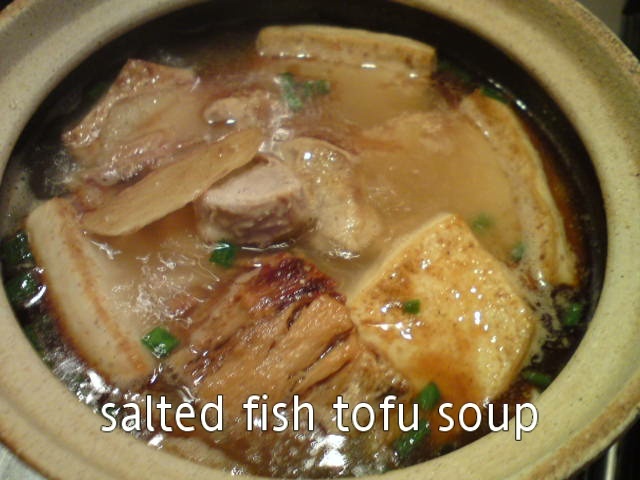 Nowadays, she does not cook this soup probably because salted fish is getting expensive and not that 'healthy' too. Usually, pork belly meat is use to cook the soup but here I am using lean meat. Once in awhile, I think it is alright to prepare this for the family because it is really a tasty soup. Prepare the above ingredients as stated. Heat wok with oil to pan fry tofu pieces until firm and golden on both sides [wait until the tofu is golden before flipping over to prevent them from breaking]. Dish out and set aside. 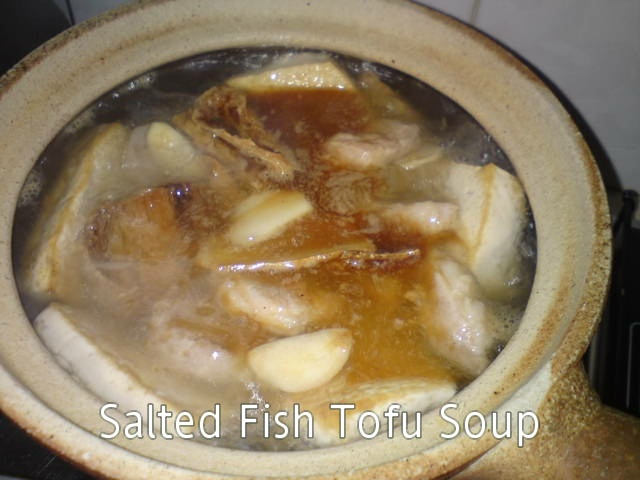 Using the remaining oil, put in salted fish pieces to fry until fragrant. Then add in sliced ginger, garlic and peppercorns. Fry until aromatic then add in the meat slices to fry for a second. Bring the water to boil in a pot. Put all the fried ingredients into the pot. Let it boil for 5-10 minutes on medium heat. Turn to low heat and simmer for another 15 minutes. Add salt and a dash of msg to taste. Sprinkle on some spring onions before serving. The soup taste better when hot. This recipe is for 2 loaves of bread. 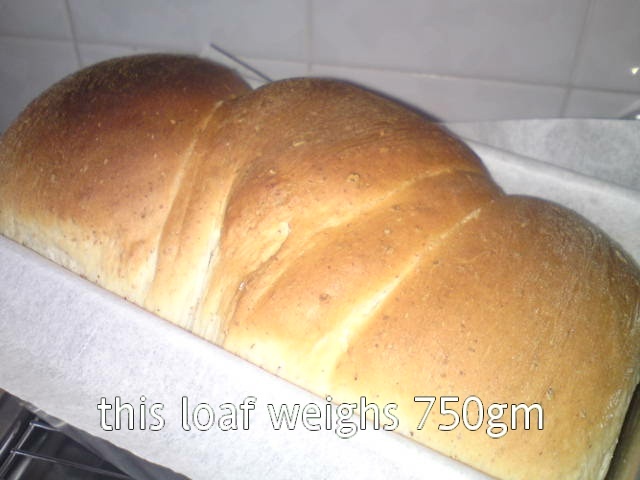 Measure half the quantity if you are making only 1 loaf [550 gm]. 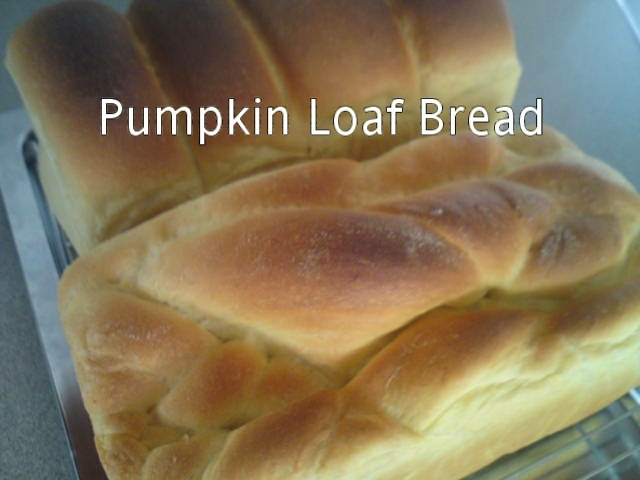 This bread is very soft and moist even on the third day. But I realised the texture is also fine which I believed could be due to longer kneading time. I kneaded a little bit longer and on faster speed because the dough was a sticky. I did not add any water to the bread dough. Good recipe to keep. Add all the ingredients [except water and butter] to the sponge dough. 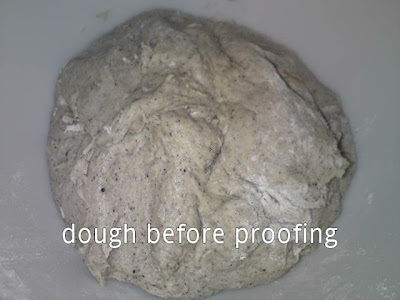 Knead until well combined, then gradually add in water [if necessary] while kneading until a soft dough is formed. Knead for about 10 minutes then add in butter. Continue kneading until soft, smooth, elastic and dough does not stick to the fingers [about 15 minutes on high speed]. Divide dough into 2 equal portions. Roll and fold each portion into thirds, then roll swiss roll style into a log. Place in baking tin [Pullman's tin] and leave to proof in oven for more than an hour or until double in size. [You can divide dough into any number of equal portions to make small loaves or braid it as I did this time]. This is a simple dish but with a variety of ingredients in small quantities. A dish that can help you clear off some of the leftover items in the kitchen cupboard or refrigerator. Here I will not provide the exact quantity of each item, it all depends on what you have on hand but of course you must have a vegetable. Here, I used brussel sprouts. 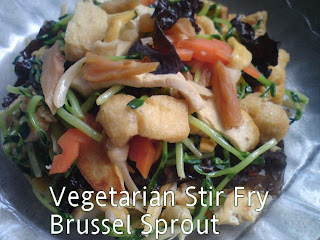 You can replace the brussel sprouts with cabbage, beansprouts, garlic sprouts and loufah. Just cut all ingredients either in strips or cubes. I added chai por which was given to me by a friend. Not that salty but crunchy. I am cooking this dish to go with porridge. Heat oil in wok to fry beancurd till firm. Push aside, then add in garlic and chai por strips. Fry till fragrant. Then add in kim chiam, black fungus, carrots, taufu puffs and beancurd. Stir to mix all ingredients well for a second. Add in seasoning, brussel sprouts. Stir and add in some water. Fry till vegetables are cooked. Only takes a second or two. Dish out to serve. Usually, when cooking fried rice, we do not add much vegetables except for some mixed vege [carrots, green peas and corn]. But I love to fry rice with other vegetables such as bok choy. 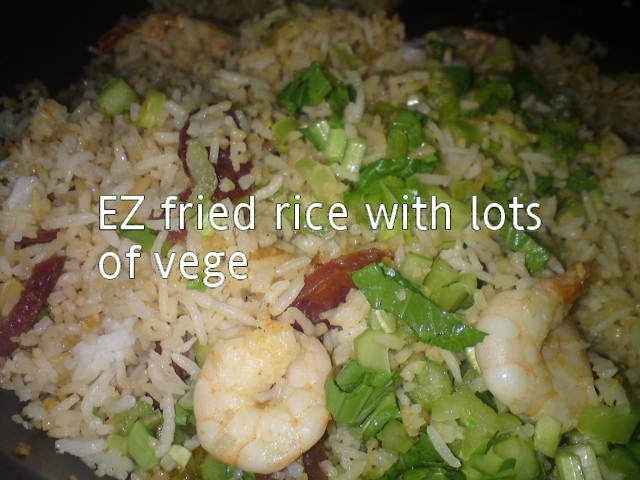 For this easy fried rice, I tried adding chai sim stems [choy sum/sawi] and use the leafy part to cook a vegetable soup [I add them to my Japanese Miso Soup]. So here is a simple One Dish Meal with a soup for the family. Hassle free meal for dinner. Wash chai sim, separate the leaves from the stems. Cut the stems into fine cubes and break the leaves into smaller pieces for the Miso Soup or any other soup preferred. Heat 2 tbsp oil in wok to saute garlic until fragrant, then add in the prawns. Fry until prawns are firm, then add in the rice, turn heat to low. Stir to mix rice well with seasoning. 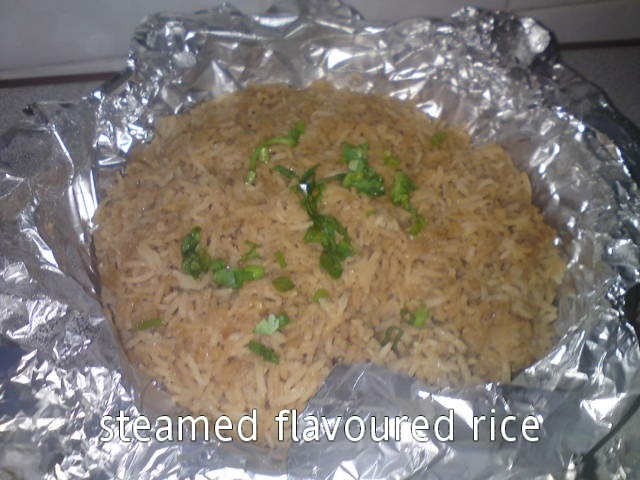 Then turn to medium heat, continue frying the rice for 1-2 seconds then add in the chai sim stems. Stir fry to mix all ingredients well. Push rice aside and add in the remaining oil . Pour in the egg. Cover the egg with the rice and continue to stir fry until egg is cooked and rice is light, then add in the sliced sausage. Stir fry for another second and dish out to serve with sambal belacan or cut chillies. Garnish with spring onions or fried shallot crisps. 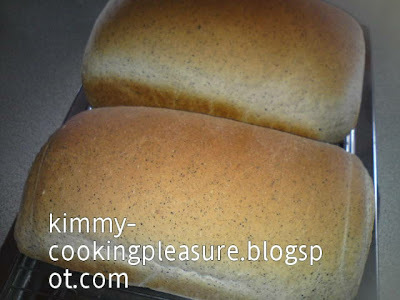 After baking the Oreo Cookie Loaf Bread several times, I really loved this bread. 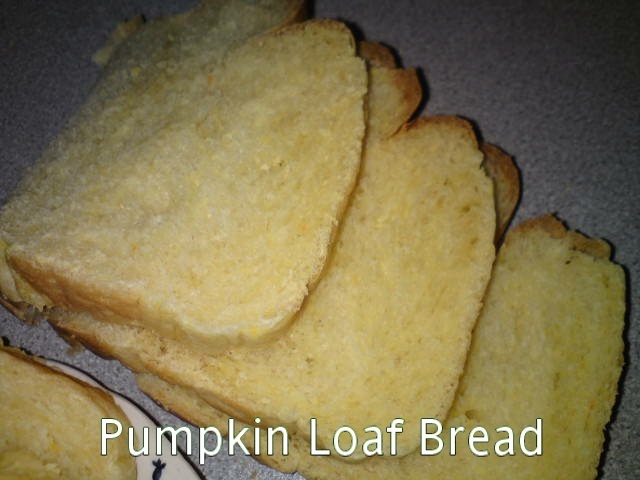 It stays soft and moist for 2-3 days and taste good too. Since I have some cream cheese biscuits, I decided to substitute Oreo Biscuit with it. The dough is easy to handle. The bread is soft and not salty. 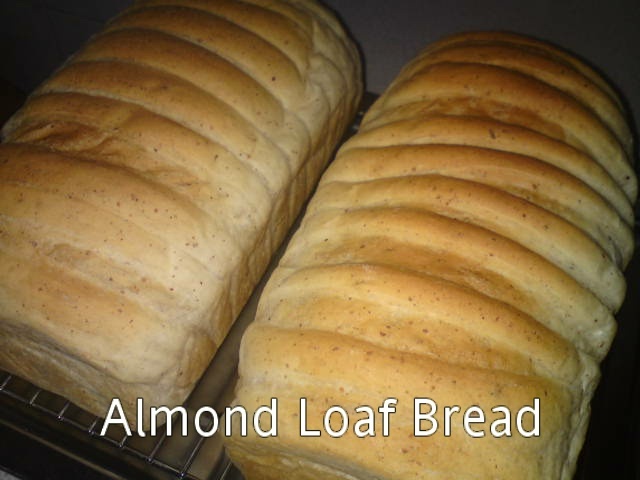 Lovely bread worth making for the family and friends. This recipe makes 2 loaves of bread. Mix all ingredients into a soft, rough dough. Cover with a clean cloth to proof for 1-2 hours or until double in size. Mix all ingredients [except water and butter] to prepared sponge dough. Then gradually add in water. 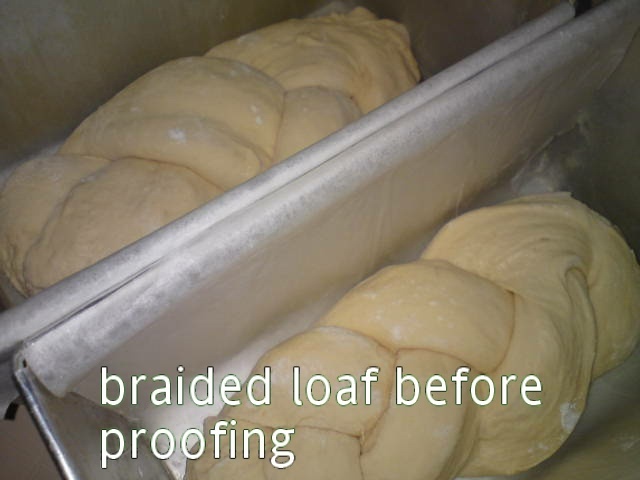 Knead until a soft dough is formed. Takes about 10 minutes, then add butter. 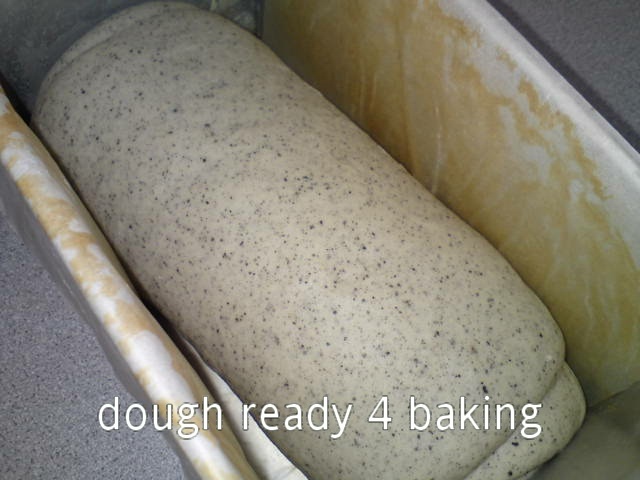 Continue kneading until dough is soft and smooth [another 10 minutes]. Remove dough and shape into a ball. 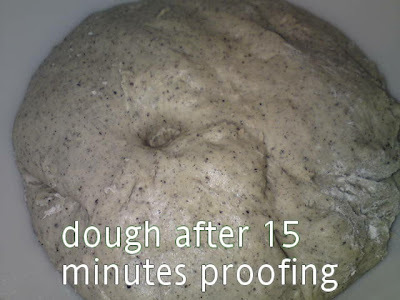 Cover with a clean cloth and leave to proof for 15 minutes. Punch down dough, then divide into 2 portions. Roll out each portion and fold into thirds, then roll swiss roll style into a log. Place in loaf tin. Cover to proof for at least 1-2 hours or until double in size. Remove from pan to cool on rack immediately after baking. I baked this bread because I have some ground almond in the fridge. 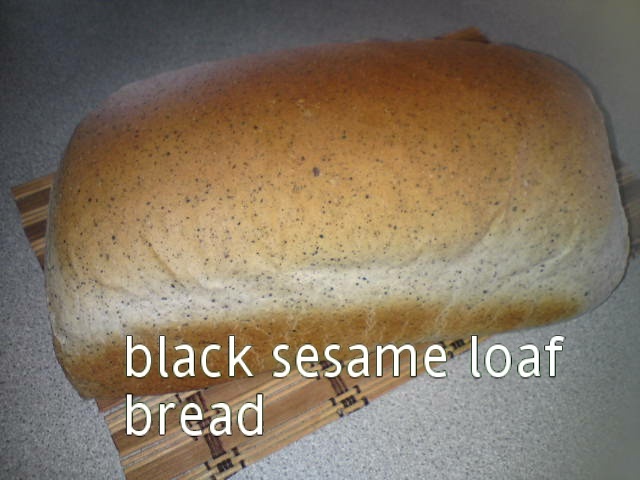 I followed the Black Sesame Loaf Bread recipe and just substituted the black sesame paste with ground almond. Here I increased the quantity because I wanted to make 2 bigger loaves of bread. Mix all ingredients into a dough. Divide into 2 equal portions. Keep in plastic bags. Tie up and keep in the fridge [I kept the 2ortions in an airtight container in the fridge]. Can be kept for up to 7 days. Thaw for 10-15 minutes before using. Tear the overnight dough into smaller pieces in the mixing bowl. Add in all the ingredients except the water, bread flour and margarine. Mix well. Add in bread flour. Knead and gradually add in water [may need less]. 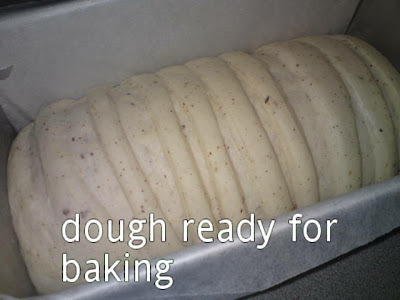 Continue kneading into a soft dough [about 10 minutes] then add in margarine. Knead for another 10 minutes on medium speed until a soft and smooth dough is formed. 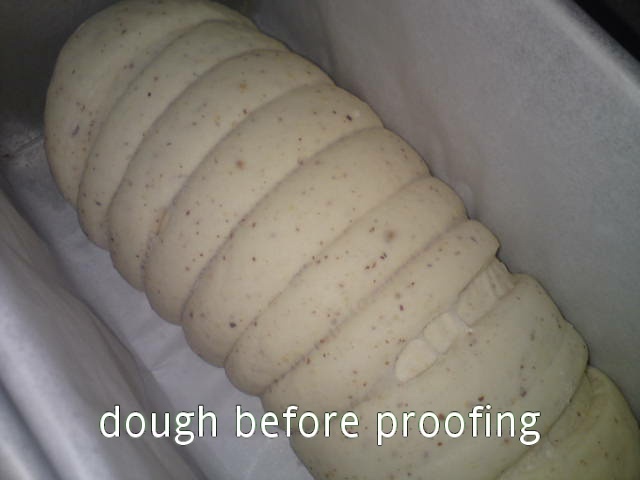 Cover and leave to proof for 15 minutes before shaping dough. 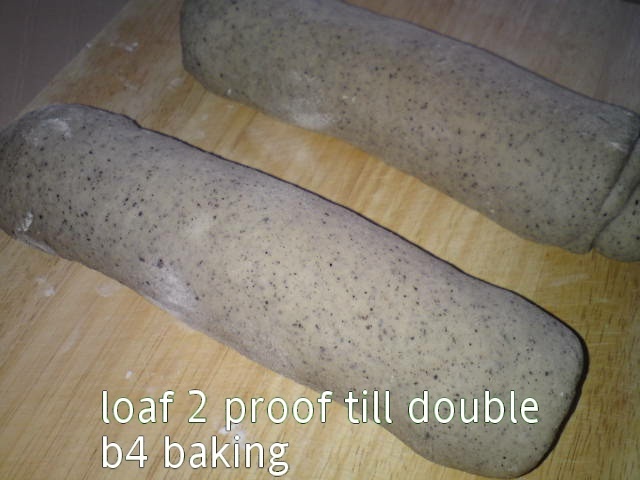 Punch down dough and divide into 2 portions [if baking 2 loaves]. Fold into thirds and roll out swiss roll style. Roll into a log and place on Pullman's tin. Cover and leave to proof for at least 1-2 hours or double in size. Baked in a preheated oven at 180 degrees for 25 minutes. Remove and cool before storing. 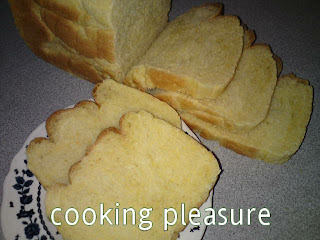 When bread is not so soft after 2 days, toast them, they taste good with butter and jam. Garlic flower sprout looks quite similar to chives [kucai] flower but when fried it has a stronger garlic taste. 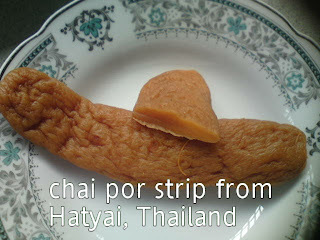 It is crispy and you can enjoy them only when you have strong teeth and gums to chew on them. I think it is a high fibre vegetable. Put 2 tbsp oil in wok to fry beancurd strips to slightly crispy at the edges. Dish out. Remove excess oil. While wok is still hot, add in the garlic sprouts and red chilli. 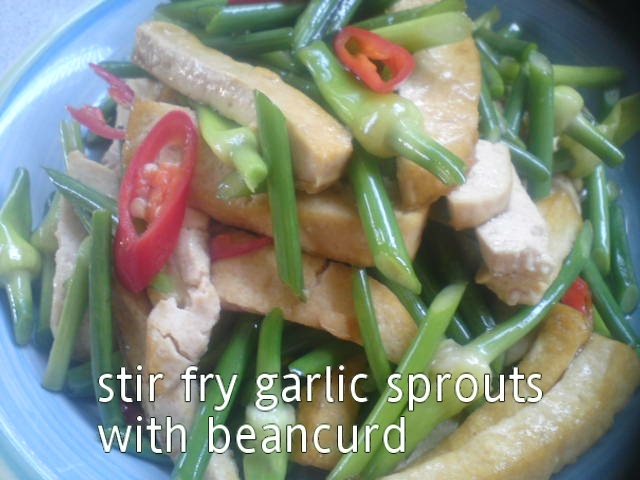 Fry on high heat for a second then return the beancurd into wok. Stir to mix ingredients well. Drizzle in enough light soy sauce to taste around the wok followed by a little water. Stir for another second and dish out to serve with porridge or rice. This is another aromatic fried rice with daun kadok [wild betel leaves], cekur leaves [sand ginger leaves], kaffir lime leaves and fish sauce. More ingredients such as lemongrass, indian curry leaves, mint leaves and wild ginger flower 'bunga kantan' can also be added if available. You can mix and match any of these ingredients, it is still okay. 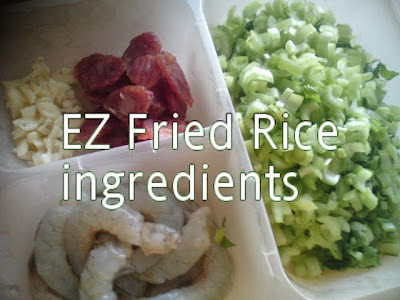 These ingredients have to be finely cut for frying this fried rice. Since, I am only frying for 2, I just used daun kadok, cekur leaves, lemongrass and kaffir lime leaves from my garden. Heat up oil, saute sausage until fragrant. Dish out and set aside. Saute lemongrass and dried prawns until fragrant. Push aside and add in rice [fry on low heat]. Stir to combine rice and other ingredients well, add in seasoning [fish sauce, salt and sugar]. Stir fry to mix. Add in all the shredded ingredients. Continue stir frying to combine all the ingredients well and cooked through. Rice should be light and fluffy. Off fire and dish out to serve with garnishing - spring onions, cili padi, big Bombay onions and eggs. Squeeze in the lime juice before serving. 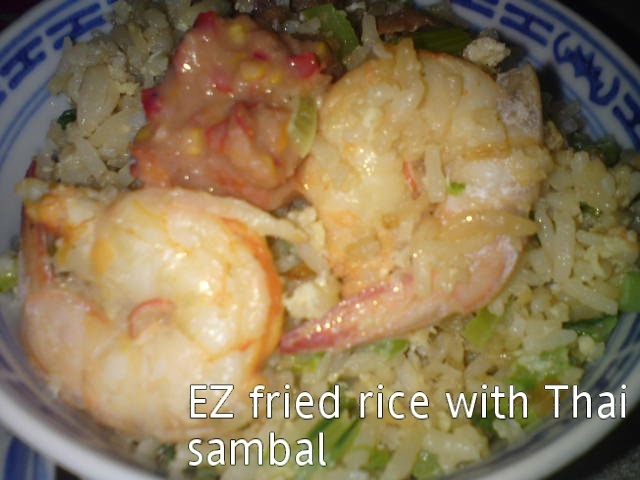 Can serve rice with Thai sambal belacan. Note: This time, I did not add in eggs [for health reason - cutting down on eggs in diet]. 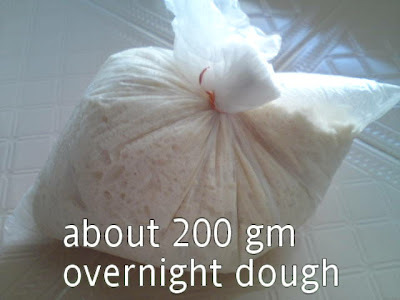 I have been following Vivian Pang's blog on bread making and sometimes wondering whether 'overnight dough' and 'starter dough' are actually the same. 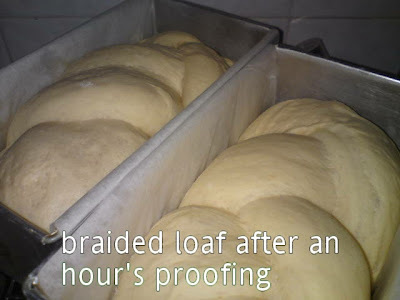 Most times, I used starter dough method to make my bread and I found the bread good [soft and moist even on the third day]. So this time, I tried Vivian's method. It is simpler as I just need to mix the ingredients and portioned out the quantity ready for use anytime. The only problem is that I need to double the quantity if I wanted to make bigger loaves of bread [2 loaves of 550 gm bread]. With Vivian's quantity, I can only make 2 loaves of 330 gm bread. Next time, I will try to divide the overnight dough to 2 portions only and increase the bread dough ingredients by 1.5 times. Perhaps, this way I should be able to get a bigger bread [enough for 3 days breakfast]. Less frequent breadmaking. Here is Vivian's original recipe. Mix all ingredients into a dough. Divide into 3 equal portions. Keep in plastic bags. Tie up and keep in the fridge [I kept the 3 portions in an airtight container in the fridge]. Can be kept for up to 7 days. Thaw for 10-15 minutes before using. 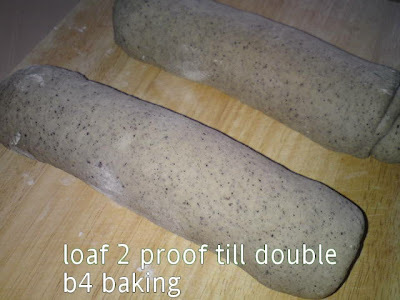 Punch down dough and divide into 2 portions [if baking 2 loaves]. Fold into thirds and roll out swiss roll style. Roll into a log and place on Pullman's tin. Cover and leave to proof for at least 1-2 hours. 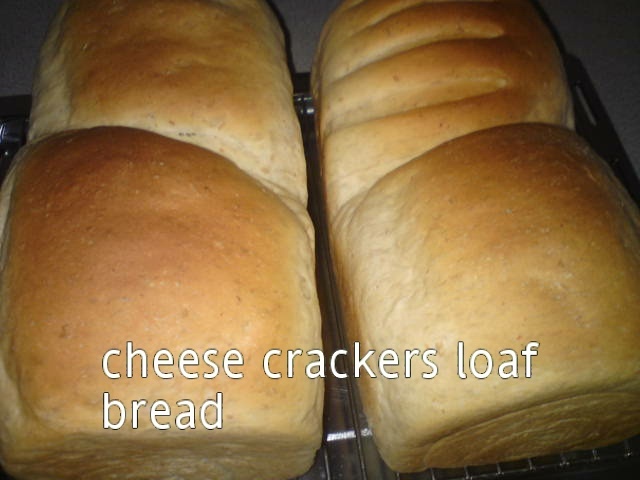 A soft and fluffy loaf bread that goes well with sliced cheddar cheese or butter spread. I tried baking the bread but substituted black sesame with toasted almond [grounded] using the above quantity into only 1 loaf. The bread weighs about 750gm. Here's how the bread turns out to be.